shell out the bucks for a commercial kegerator. insulating shell that slips over the keg with a chilling piece on top. Anyone have a good solution for chilling a half barrel? have not found the exact information I need." thermometer to tell me that. HERMS system. It's under construction but here is a link anyway. >pounds for 5 gallons of beer. need about 10 sq. meters, which is about 100 sq. foot. An area of 100 sq. of grain, which is substantial. ballpark figures, I'm not looking for a big discussion on this. >  people dump on him not for using "fanciful"
>language or winespeak, but for the descriptions themselves. both bad descriptions but primarily his use of terms in describing beer. >Look, dear! The tide of my beer is in! Terms similar to "undertow" are successfully used in describing wines. >"The flavors become more integrated at the end." thru to the aftertaste is a defect in the taster not the description. >avoid such "fanciful descriptive language" like the plague. it well or incompetently isn't the issue - never was. Salvator Bockbier , Stout , Porter, Alt Beer, Bockbier, Schwarzbier". it's a useful book for non-partial mashers too. coordinates to describe our geographical position. survive what must have been a shocking case of indigestion! SG 1050. The sample is dominated by diacetyl. been going on. Hell!! Rob Moline has been telling us this for a long time. beer when I keg it in a week or two. Sanders on the fateful night the salty silenced him? Darlington Ground setup to control my SSR's. 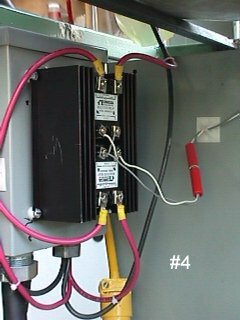 I use 40A SSR's which can handle 80-300V, as I use 240V to power my RIMS. can find is the Bloatarians upcoming Bock competetion. Thanks. P.S. Anybody going to the Real Ale festival in Chicago in a couple weeks? intensive bed growing techniques. Yes, even with crops like corn. The key, of course, is good soil, and attention to watering. questions of the day for all you experts out there! there are only so many brands available at the brew store. supplies for homebrew in Canada (or get them myself in Ottawa, Ontario)? either undershooting or overshooting the target levels significantly. increase carbonate levels with out increasing the calcium level. reconditioned them and sold them cheep! In working with them over several years, they gave me THEIR secret. They told me it EVEN removes rootbeer flavor from the gaskets!! should have no chlorine exposure. of the opening to act as a seal with a SS lid and a weight on it. the thing and scrub away after fermentation. fermentation at all? Any other thoughts/concerns? >a plastic masher, how does one deal with the different mash >temperatures? >temps not possible without a heating element? (2) Decoction, remove part of the mash, boil and add back. I have done both with my GOTT. First recomendation is use a 10 gallon Gott instead of the 5 gallon. the grain bed and start the second runnings. better, like National Public Radio reporters, say or write "jive." I've seen it here, too, but I cut non-professionals more slack. >average of 6072 lb/acre of barley. lawn grass) as a cover crop and it's dense enough to keep weeds away. barley seed to get that 30lbs of malt based on various seeding calculations. Not a very high multiplication factor. Weed-whacker - excellent idea for a cereal reaping - thanks. >barley by hand in their driveway, beer in hand! is AC, it doesnt matter. controlled by DC voltage from the PID. Vince is - or was - a sometimes homebrewer. Belgian Farmhouse Ale. Quite tasty. from boiling. It would be concentrated, if anything. to something better suited to a beverage? Pipkin, Harrington or Golden Promise? discussing it with several HBDers,...mostly offline. for my fragmented , but well intended thoughts and questions here..
(like German Lager 830). Cannot I use it along with the  Pilsner...? the relatively higher amount of fermentables, in say a DoppleBock? in attenuation  or floculation than the other? Thinkin' way too much...and I need to get home to a brew! almost spot on temp wise. on converting a gott cooler to RIMS. step up to some converted kegs + 10 gallon batches. draining to filter out the pellet residue. Works great with minimal whirlpooling. >primary fermenter) to remove the trub on the bottom of the fermenter. >mix it thoroughly in the beer, then bottle normally. >my 1500 W heater element (at 120 V). Is this correct? >buy one I wanted to ask those in the know. DC on its input (SSRs take DV in and control AC), so that won't work. starting relays can handle that kind of load. >  3.. Use it for mashing, then remove it for boiling the wort. >and especially if they use it while boiling wort. Count me in the first part of #2.
my wort, if it's the same SG. in then too. And for cooling, so that I know when I'm done.